The Cell Therapy Laboratory presently produces the following cell therapeutic products: therapeutic products containing bone marrow origin stem cells for transplantation of hematological and autoimmune patients. There is a demand for the transplantation of organs in several areas of medicine. It is usually the last solution, when other medical or conservative therapies do not provide a promising solution for patients. This is the case with hematological diseases, when pathological cells, which significantly differ both quantitatively and qualitatively from healthy human cells, are developed in the blood (in most varieties of leukemia). Pathological lymphoid nods and pathological organs can develop in Hodgkin-disease and non-Hodgkin lymphoma. In these statuses the only therapy that may improve life quality or guarantee survival is the replacement of the bone marrow. 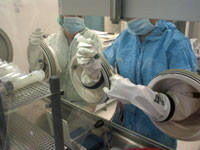 In this procedure the patient is treated with their own stem cells that were previously frozen. In certain cases no stem cells can be harvested from a patient. The solution is allogeneic transplantation: after having checked the required compliance of immunological properties, the patient receives stem cells from a foreign donor. In case of certain hematological diseases, the bone marrow might contain tumor cells that are to be destroyed by means of chemotherapy or total body irradiation. Even in case of administering autologous stem cells harvested from the blood it might happen that tumor cells are also given back to the patient, which may cause the recurrence of the disease. In these cases, the stem cells originated from the patient’s blood or bone marrow are separated, before transplantation. 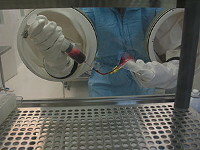 Blood or bone marrow stem cells have to be frozen till -90°C following a very precise and sophisticated procedure. Afterwards, the freezing bags containing the cells are stored in liquid nitrogen at -140°C or below. Cells can be stored at this extremely low temperature for decades, and after thawing the viability of the cells is usually higher than 90%.